Its that annoying time of the year again when the weather really can’t make up its mind what it wants to do, and you leave the house layered up to the heavens to battle the cold only to be stripping off several hours later in a frenzy once the sun comes out. Despite the fact that I am absolutely not in any way a sartorial expert, and my idea of dressing for the weather seems to revolve around crop tops in winter and sweaters in summer, I thought I’d put together a little post featuring some of my favourite autumn/winter outfits from the last two years of blogging and some handy tips for tailoring your wardrobe to the elements (no crop tops involved, promise). 1. Which jacket? – ok so this seems completely obvious, but for me I tend to leave the house either with a heavy coat that I end up dragging with me for the day once the sun comes up, or with no jacket at all and therefore cursing the dropping temperatures while turning an attractive shade of blue. This winter, I have made sure I am adequately prepared with a selection of jackets both light and heavy weight to carry me through the season. Every morning, I now check the weather on my phone before I leave the house, and use the average temperature to judge whether or not I need a lightweight jacket or a full on winter coat. Some mornings however, there just isn’t time to faff around with apps – for those mornings I recommend a lightweight jacket with a sweater underneath for warmth – that way you’re covered no matter the temperature. 2. Layers – or as M Bezza calls them ‘lairs’. I never got into the whole layering trend until I started blogging. For me layering clothes always reminded me of when my Mum would make me wear a vest underneath my jumper when I was a kid so I avoided it like the plague. However as I’ve got older I’ve slowly started to appreciate it more and more – layering a selection of lightweight and breathable fabrics keeps you warm while still keeping you stylish as hell and eliminates the need carry a jacket with you throughout the day. 3. 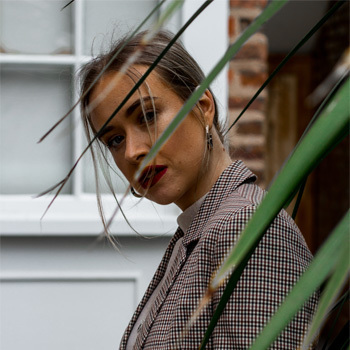 Consider your silhouette – the problem with winter and it’s subsequent baltic temperatures is that you can so easily find yourself completely smothered in winter coats and scarves and soon enough your super stylish outfit you’ve put together begins to lose it’s edge. To combat this, I always seriously consider the cut of the jackets I buy in order to make sure I don’t lose focus from the rest of my outfit too. The winter coat I have this year is beautifully cut and really compliments my figure – this means it will also compliment dresses, trousers and smarter clothes however it won’t suit joggers and a lot of the sportswear I tend to throw on. This is why I have a more lightweight jacket with a different cut – best of both worlds! Do you guys have any tips on battling this awkward season? Let me know in the comments below, I’d love to read them!